Size: Large, Color: Yellow is currently out of stock! Size: X-Large, Color: Yellow is currently out of stock! 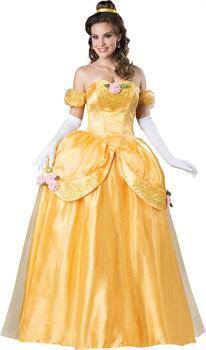 This costume includes a shimmering yellow dress and petticoat. Does not include earrings, white gloves or headpiece. We all love classic stories since our childhood and always excited to revive our lovely memories with Disney classic costumes. Transform yourself in the most beautiful prisoner of a beast and impress everyone with beautiful voice. Live with classic fairytale Beauty and the Beast characters for a moment and feel real love. Do you aspire to be the show stopper of your costume party? Women's love to explore many costumes ideas before deciding for her party costume. Get the perfect attitude and look in Disney Beauty and the Beast Belle Ultra Prestige Adult costume.